Taylor's Sweet Little Art and Nerd Site: Sketch Card of the Day- The Horde Trooper! 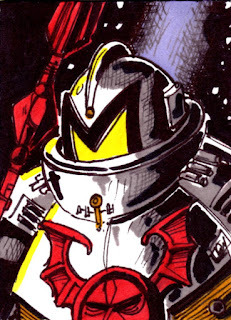 Our sketch card of the day is the Horde Trooper! When I was a kid, I searched everywhere for this action figure! I really wanted one! Not only was this guy bigger than all of the other Masters of the Universe figures, but he also had a cool action feature of falling apart when you hit a big red button on his chest! Yeah! Think about it, if my Fisto action figure hit the Horde Trooper square in the chest, this guy would fall apart! This seems silly, but even now I am quite excited about the idea. Action features on toys, back when was a kid, was a deal breaker for me. Other than the really cool toy, the horde trooper was nothing more than a mindless robot that built up Hordak's army. The cartoon portrayed them as a basic army builder. There is not a lot to say about them having a back story or even a story to be excited about. The Horde Trooper action figure went to store shelves back in 1986. I never found one to add to my collection. These days I will check out the prices on ebay, and they are rather expensive for not being complete and really expensive if it has it's staff. I really don't see me getting one, because I just don't have the extra money for this. So far, there is no word of if Mattel will do a Masters of the Universe Classics version of this guy. If they do, I might look into getting one, but that depends on it's action feature...You can also see this art piece here.